This entry was posted on July 29, 2013 at 3:22 PM and is filed under CYCLES, UPDATE. You can subscribe via RSS 2.0 feed to this post's comments. You can comment below, or link to this permanent URL from your own site. You should read my past blog reports on Hurst cycles and see if that answers your questions. 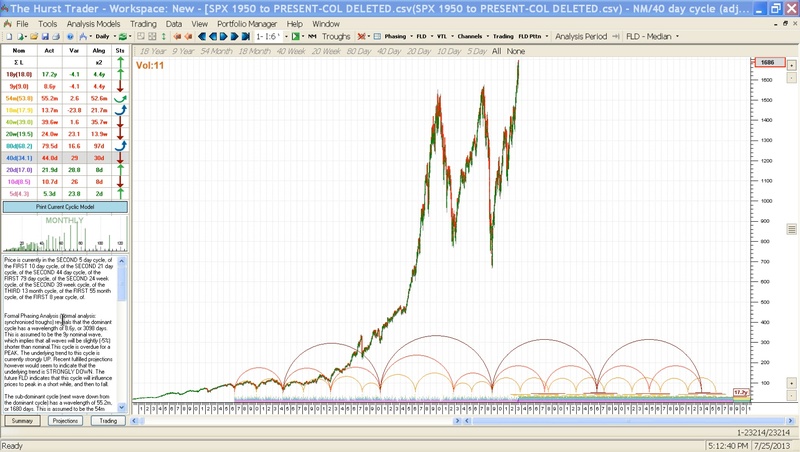 In the past reports, if the cycle charts show a bottom coming soon, look at the actual chart for that period and see what really happened. I did a study of how well the software performed on the 2009 bottom. It only did a fair job on that one and didn’t recognize the bottom in real time. 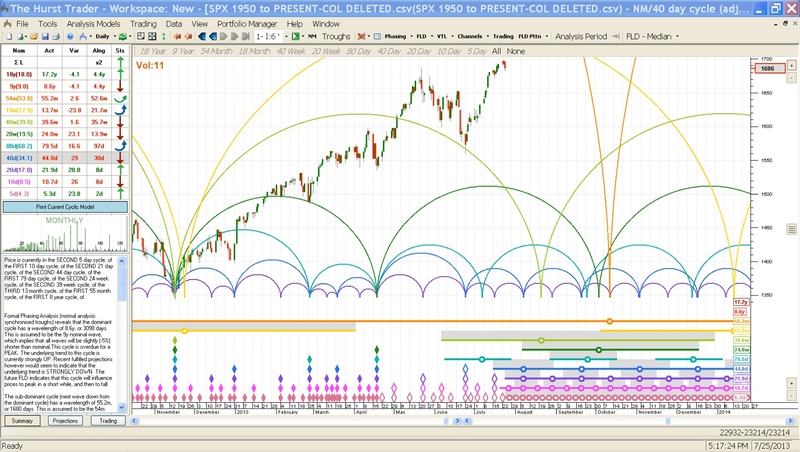 It recognized the 2009 bottom, months after the fact. But it has done an excellent job on the smaller cycles since 2009. 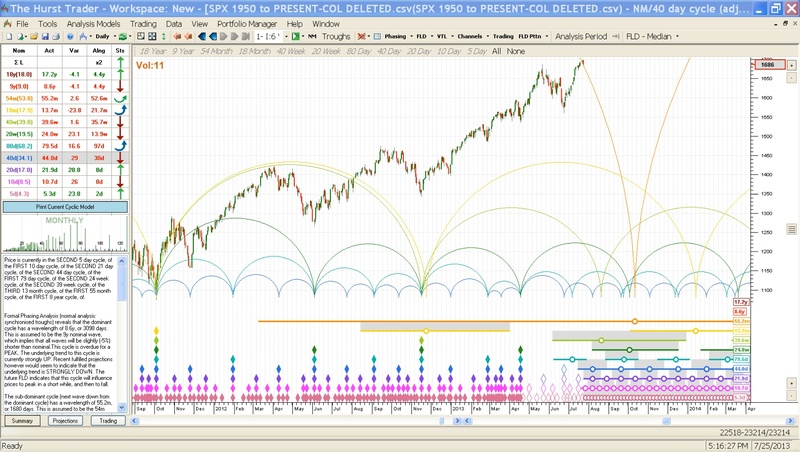 The March 2009 bottom was a MAJOR event in Hurst cycles. 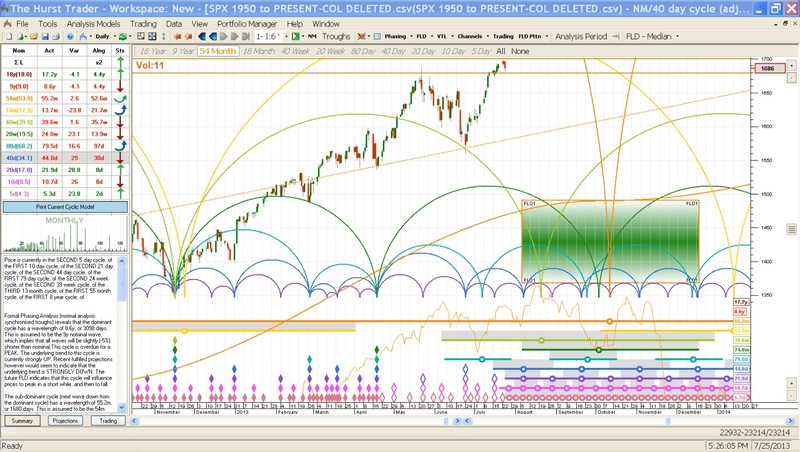 Hurst analysis shows everything from 18 year cycles on down, bottoming in March 2009. 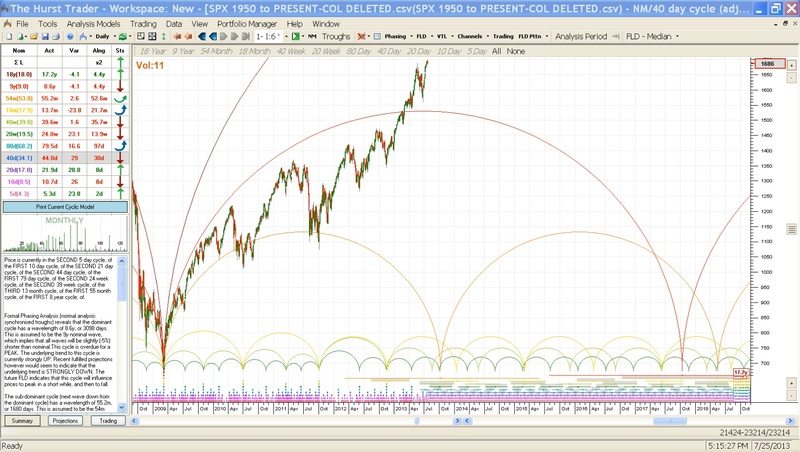 At the time, I didn’t see 2009 as that significant of event, a significant bottom yes, but not an 18 year cycle low. 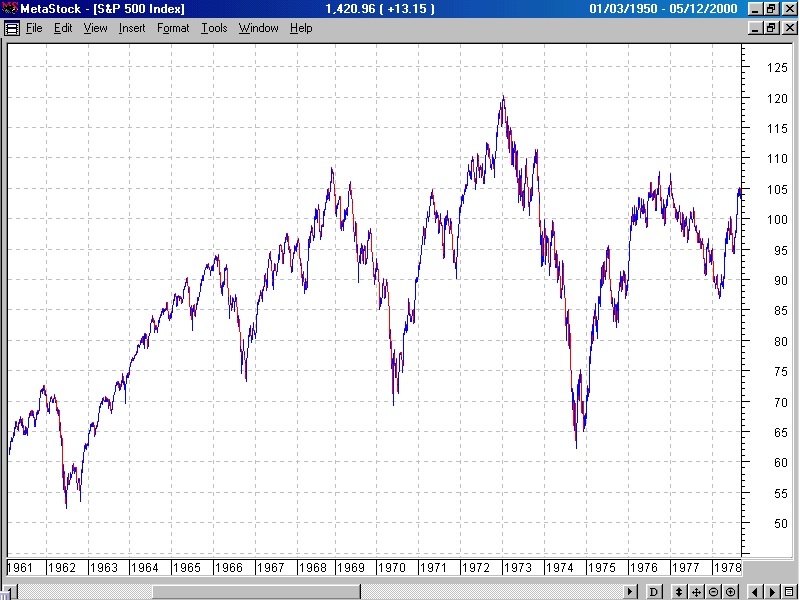 If the 18 year cycle continues to exert a strong influence on our market, it doesn’t crest until 2018. The 9 year cycle is cresting right now. 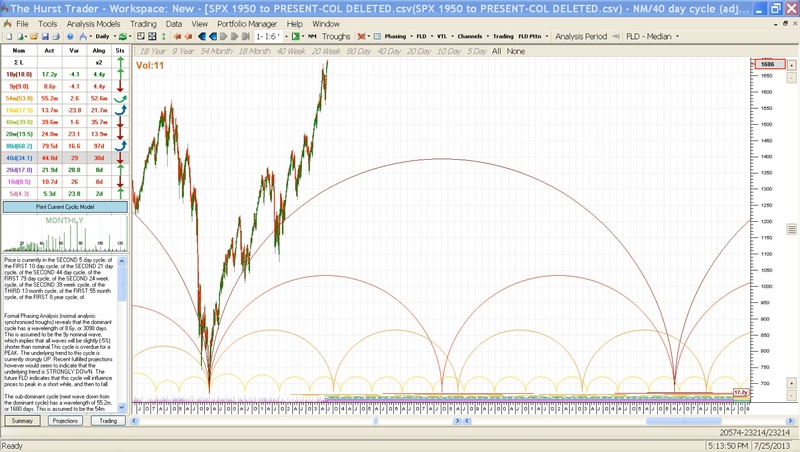 We’ll see which of these two cycles is calling the shots when we are passed the next significant bottom. If the 18 year cycle is dominant, we’ll see more all-time-highs. I haven’t researched other major bottoms similar to 2009, but I think that’s a good project for me to undertake soon. I’ll post it in my blog when I finish. Thanks for the fantastic information Bob! Just a quick question. You mention that Hurst Cycles are frequently accurate, but would you be able to give us a rough quantification based on your years of experience using Hurst analysis? Example: would you say that out of 30 forecasts that at least 18 (60%) would correctly forecast direction with timing that is accurate enough to be useful? I could be wrong, of course, and without doing my homework, it appears that cycle analysis may suffer from the same problem as Elliot wave: it can be modified after the fact to fit our biases (having said that, I do like Elliot wave sometimes… it is a love/hate relationship). Do you agree with this?